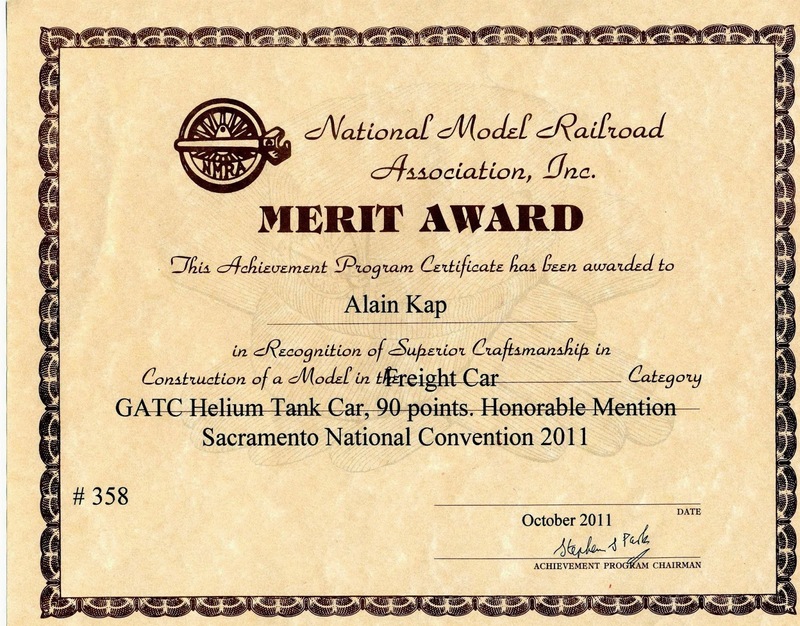 After my initial success with the Helium Tankcar back in 2011, I wanted to get this certificate done as fast as possible. I decided to mostly scratchbuild the remaining cars, to be on the safe side, so I had to plan ahead with the BR convention in October 2013 being my goal. 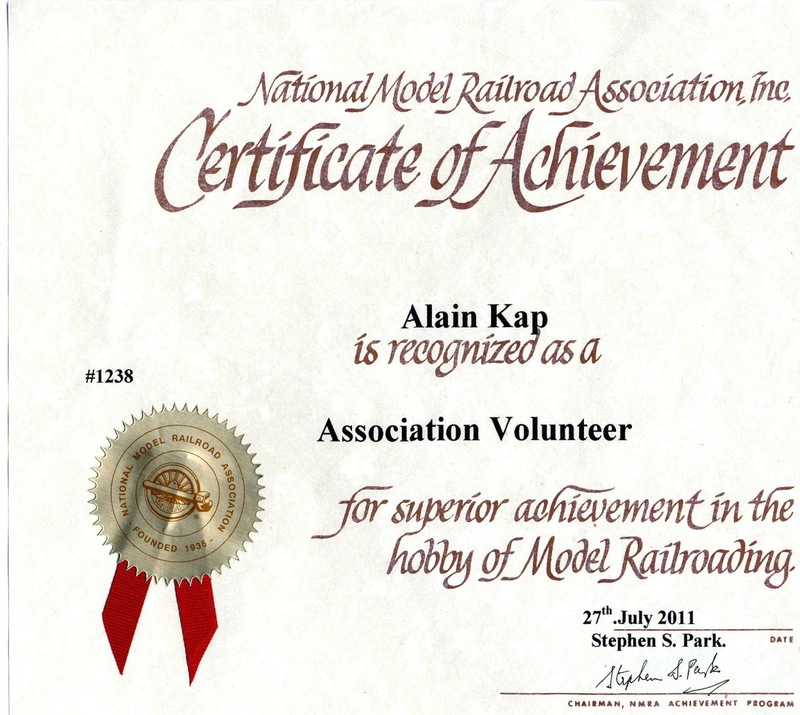 I am also a Narrow Gauge Fan, so my other half of the models were build in On3 gauge. I had a couple copies of plans for Southern Pacific Narrow Gauge cars that I wanted to build. With most narrow gauge equipment the basic car was the Flatcar, on which everything else was build up. As I said above, the basis for most cars was the Flatcar, so it was obvious to include one. After I finsihed tha car I found that this was too simple and that I could easily build a gondola by simply adding the sides to the stake pokets. The sides are basically two boards attached to stakes. I installed a total of 176 nut-bolt-washer castings. The sides are inserted into the stake pockets. So I have two cars in one. In a Narrow Gauge Gazette I found an article about this spreader in HOn3. I liked the idea of scratchbuilding the superstructure and especially the spreader blades. There were only a couple of black and white photos to imagine how the real car looked and what particular details it had. The HOn3 model was a bit to small to recreate all visible details in the photos, but in On3 it could be done. The spreader superstructure was mounted to the flatcar with brakets and U-bolts, so I believe that it could be removed as well. This was a very nice detail to model, as well as the blades that can be swung out and locked in place with small bolts. The spreader blades are 3 pieces of brass sheet, soldered together following the drawings in the article. I also drilled holes to install some nut-bolt-washer castings. The flatcar is a superdetailed Bachmann underframe. These are intended to replace the stock underframes from the On30 cars. I installed tension rods, new brake gear, stake pockets and wood planking. The last car in the row, although my first On3 car that I've built also comes from an article in the Gazette. Lee Vande Visse built it back in the 1980's for a contest. Again its unique design, a common practice with many narrow gauge railroads, inspired me to build it. Based on a D&RGW flatcar it has a "homemade" shack to protect a gasoline winch that was used to tear up used rails for replacement. The A-frame rack and cable guide are the most visible details as well as the reinforcement rails along the deck. Sometimes these rails were also installed to the underframe, but here they are more visible. They are also attached with U-bolts and brackets. 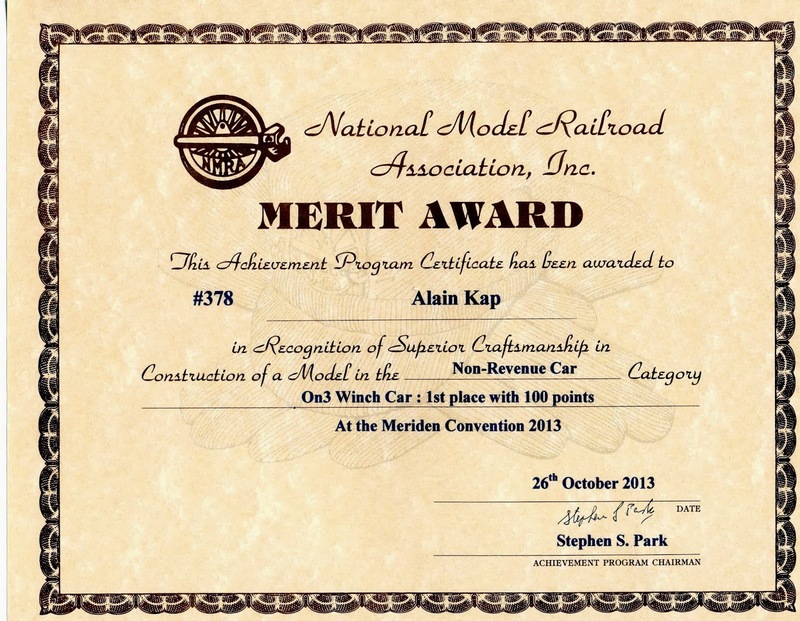 I was totally surprised that all of my five cars received a Merit Award, although I only needed three to meet the requirements. Take care to keep everythin level and square. Watch for fuzz and sand it away. Check your plans and photographs thoroughly and try to add all details that should be there, either through scratchbuilding or commercial castings. Supply as many drawings, photos (black/white or color), articles etc, as you can. This is a dead on category where you cannot have enough reference material. You probably noticed that I scored an average of 23.5 out of 25 in this category. Decide whether you recreate a used or an almost new car. The finish should be appropriate to its "age" or the prototype pictures that you supply. Watch for a neat paint job, without running colors. If weathering your car, don't overdo it, but remember: even a new car already shows some weathering, if only on the trucks. Scratchbuild as many items as possible. If you scratchbuild hardly visible parts, do mention them in your description so that you get credit for. Scratchbuilding as many parts as possible is definitely the way to go, although this category only counts for 15 points, but it might be just these points you'll need for the Merit Award. I might have forgotten to mention a couple of things but before starting I advise you to read, and reread the instructions for every category and if in doubt, call your AP manager. 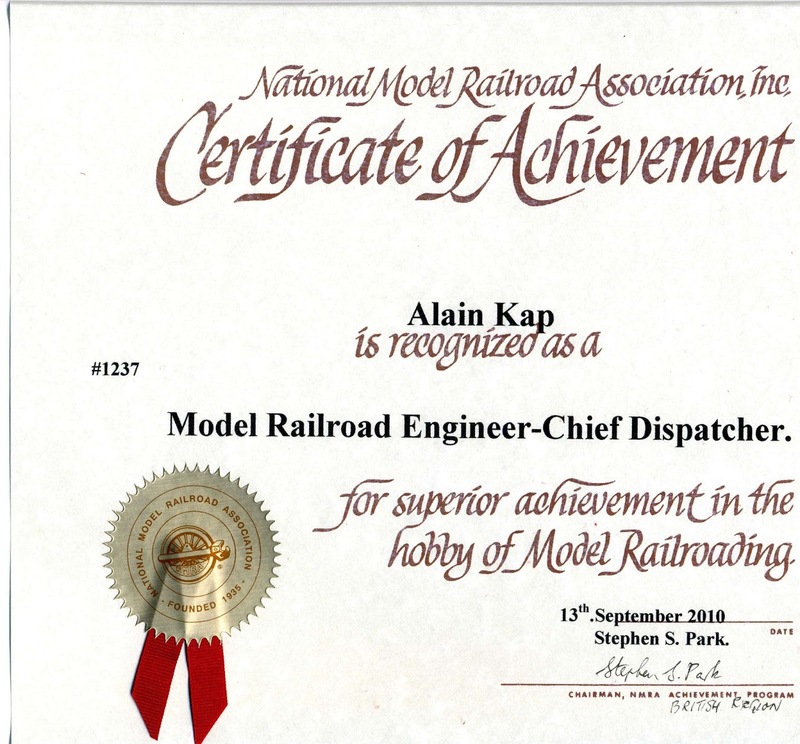 With the Master Model Railroader Certificate almost within reach, it was time to turn to building rolling stock models to complete my required certificates. Different types of cars have to be modeled with a total of eight. Four models must reach the minimum of 87.5 points. After having completed six certificates already I was now confident that I could also succeed with cars. I also had the different cars in mind that I wanted to build like a Flatcar, a Boxcar, a Reefer and perhaps a Tankcar. The car I had in mind was not an ordinary Tankcar like the one everybody knows but a Helium Tankcar. At a swap meet I purchased an old Ambroid kit of exactly this car. This was a wooden craftsman kit with a handfull of stripwood and metal castings. I took the plan and purchased Evergreen styrene strips instead. If you ever tried to make wood look like metal you understand my reason for doing so..
From the old decal sheet supplied in the kit I drew new decals on my computer and printed them out on plain decal paper. 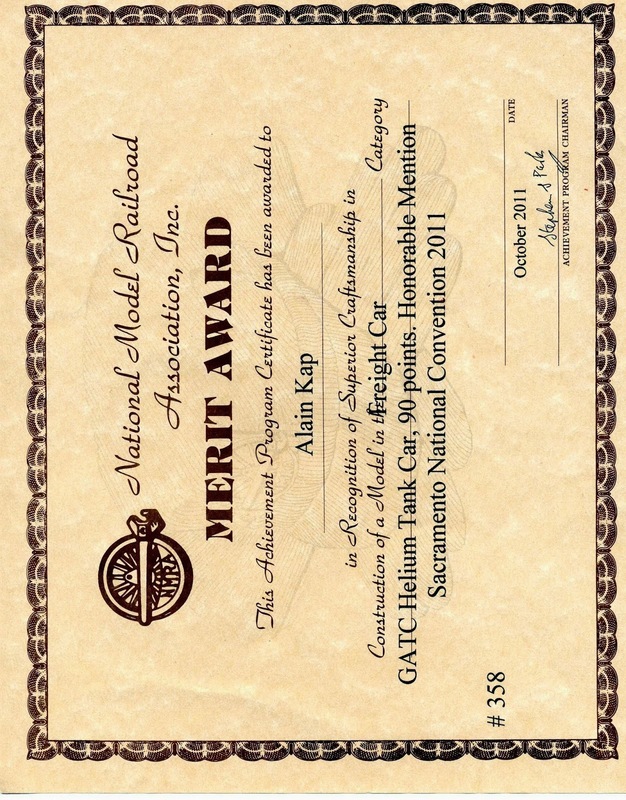 I finished the car right on time for the 2011 NMRA convention in Sacramento, Ca. I was very excited about the score it would get. I invested so much time to build this car, so if it would not get the minimum score I didn't know what to do to succeed in this certificate. After the judging was finished the car earned 90 points out of 125, a Merit Award and a Honorable Mention. I had convinced the National Judges of my skills and now I knew that I was on the right way. Cars is probably one of the most challenging certificates because the models you have to build are not static like structures are. When installing the brake riggings, you must take care that the trucks swivel enough to negotiate turnouts and curves, It is nevertheless one of the most rewarding experiences that I've made. To see a piece of rolling stock emerge from a handfull of strips and bits and pieces. I decided to scratchbuild all of the remaining cars, because the chances are bigger to reach the needed score. 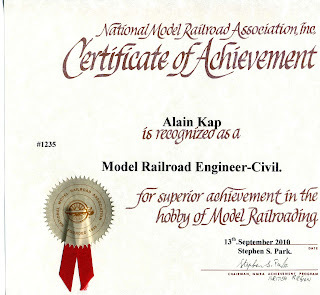 The first certificate that I started to build models for was Master Builder Cars back in 1999. 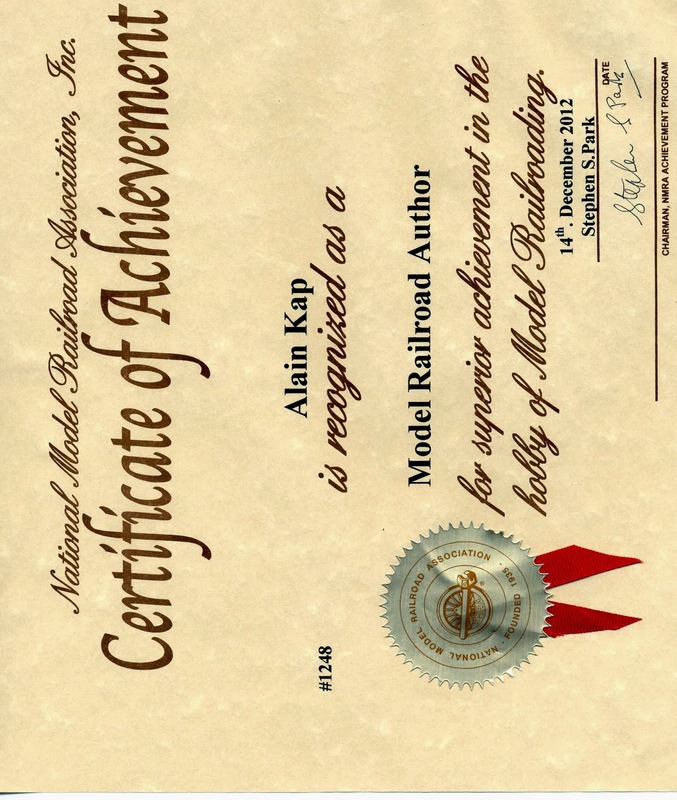 That was the time I was persuaded that this would be the easiest certificate of all (!!). Ha! I submitted my model at the NMRA concention in Minneapolis/St. Paul in 1999. Although the judges certified me a throughout good job, it nevertheless earned only 64 points out of 125. This judgement made me aware of the fact that I probably had not the required knowledge yet to succeed in this certificate. I then put cars on the backseat and continued with structures instead. 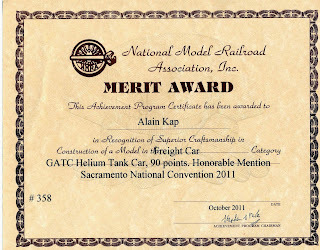 In the meantime I tried my hand on scratchbuilding a simple flatcar and entered for merit award judging in 2003 or 2004 at the British Region convention. I probably did not do enough research and although it was almost completely scratchbuild except for the trucks and couplers it only earned 68 points. That's when I laid cars completely aside for a couple of years and it would only be my last certifcate that I completed before MMR. 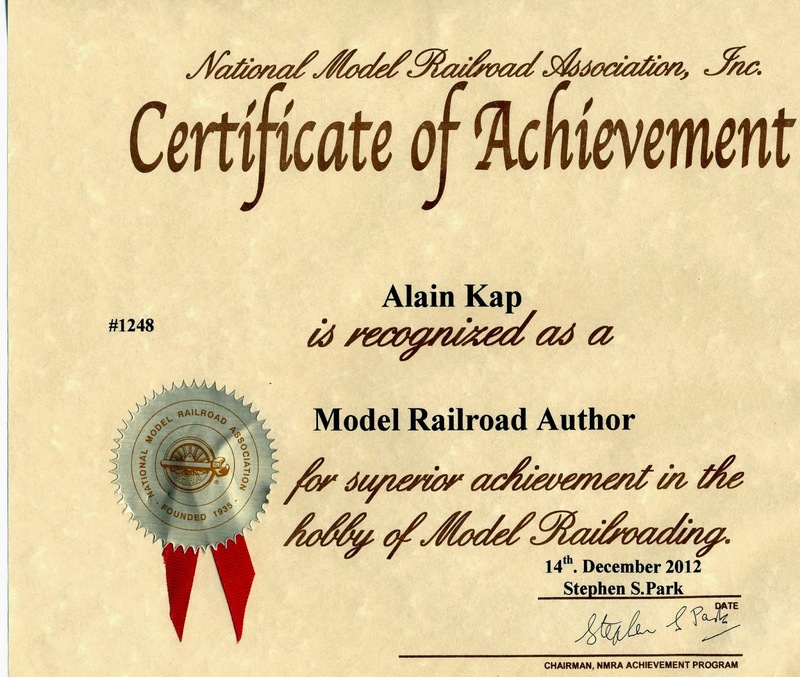 The title of Master Model Railroader is not an easy one to achieve. 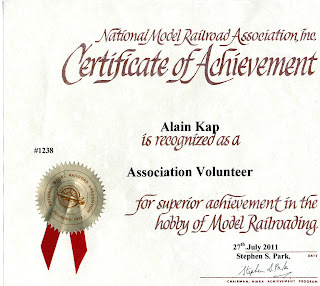 In case you are wondering how many modelers have attained the title, take a look at the Master Model Railroaders list. 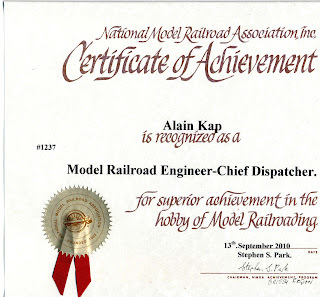 Along the way to earning the title of Master Model Railroader, you will have a lot of fun with your modeling, and learn many new skills to boot. I have accumulated the necessary Time Units (TU) during various conventions and exhibitions around Europe, as well as British Region conventions. 1. Prepare a schematic drawing of a model railroad layout meeting the operating conditions described in (A), and indicating all pertinent simulated distances. 2. 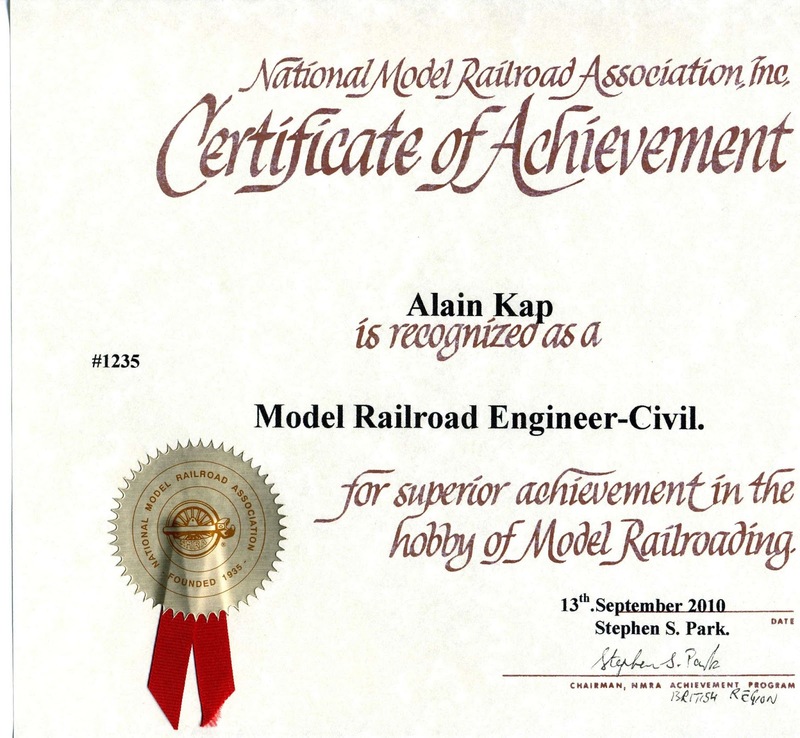 Develop a timetable appropriate to this model railroad, simulating prototype time, covering a period of eight hours or more, during which at least three scheduled mainline trains move in each direction. 3. 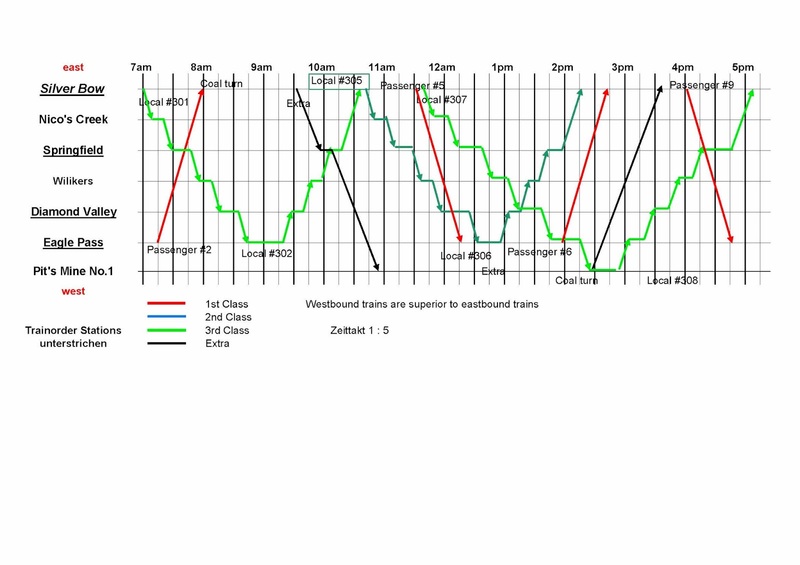 Develop an operating train chart (graph) which interprets the above schedule for timetable operation of the model railroad. Indicate at least one train meet on the schematic drawing required in (B-1) above. 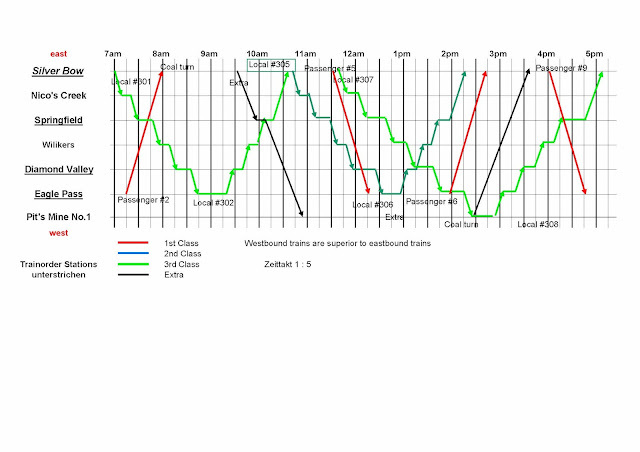 Show the position of the trains involved and describe the action, giving pertinent time and movement data to effect the meet. 4. Develop or adapt a system of operation for the layout in (A), including all the necessary forms and explanations for their use for controlling car movements, train makeup, and operation in a prototypical manner. 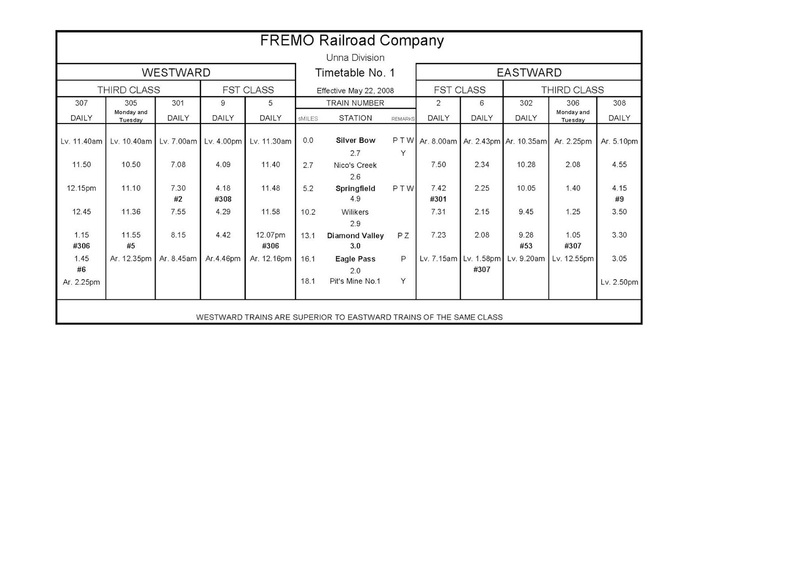 Following is a typical timetable and train chart for one of the FREMO meets where I accomplished the above tasks. To complete all the requirements for this certificate it is important to document all the jobs you did on a layout, be it club or own and to get it certified by a qualified NMRA member. This may take several years to collect all the time units necessary. If you operate on your home layout, take care that someone on your operating crew is qualified to sign off your accumulated time units and the different jobs. It took me some headscratching to backdate some of my time units but fortunately I operated always on FREMO meetings, so at least this was retraceable more or less.